Anytime is a good time for a nice cup of tea. 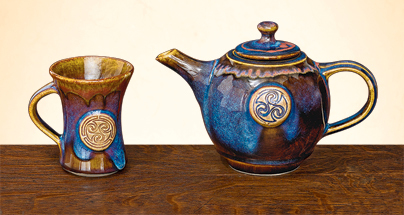 Brew your best "cuppa" in this friendly teapot from Irish artisan Colm de Ris. Luminous glaze in rich blues, purples and umbers is highlighted with scarlet, a triskele adorns one side. 6 1/2" high to top of lid. Holds 36 oz. Take your tea in the flared mug. 4 1/2" high, holds 10 oz. Each piece is individually thrown and glazed; expect noticeable variation. Oven, microwave and dishwasher safe. Handmade in Dublin, Ireland. Gift wrap and rush delivery are not available. Sorry, teapot no longer available. The photo shows a mug which is predominantly golden brown with splashes of blue. I received a mug which was 99% blue, like the matching tableware. I realize hand-crafted items can differ, but they should not differ so radically without notifying customers. I never would have ordered this had I known its true color, and now I pay return shipping. Not happy. Owner Response:Thank you for your review, Rince. We're sorry you're disappointed with the color balance of the item you received. These items are indeed works of art, all hand-crafted, and the color "splashes" do vary with each piece. We are always happy to inspect our current stock for you, if you have a need for a dominant color or pattern style. Please call us at 800-207-4256 to discuss that possibility, if you wish. I love this teapot. The colors are unique and the shape is classic. I've already used it. The only thing that I would like the artist to know, is that that inside rim of the top is rather rough and had a sharp point. Otherwise it is quite happy amongst my over 70 other teapots. first time user. Very happy with the buying experience.